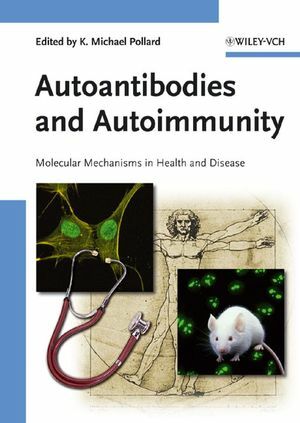 This is the first book to address all aspects of the biology of autoantibodies in a single volume, including a discussion of immunology, experimental models, clinical aspects, and the use of autoantibodies as probes in molecular and cellular biology. The editor, currently professor at the W.M. Keck Autoimmune Disease Center of The Scripps Research Institute, has assembled an all-star team of authors to report on the latest research, technologies, and applications. Following an introductory chapter, the book goes on to cover such topics as cellular mechanisms of autoantibody production, clinical and diagnostic usefulness in human disease, and animal models used to study the elicitation of autoantibodies. The whole is rounded off with a look at future perspectives. With its comprehensive coverage, this volume will appeal not only to immunologists and clinicians but also to cell and molecular biologists. Kenneth Michael Pollard is Associate Professor at the W.M. Keck Autoimmune Disease Center, Department of Molecular and Experimental Medicine, The Scripps Research Institute, California, USA. He gained his doctorate from the University of Sydney, Australia, and worked at the Sutton Rheumatism Research Laboratory, St. Leonards, Australia before joining The Scripps. Among others, he is a member of the American Society for Microbiology, the Australian Society of Immunology, the RNA Society, the American Association of Immunologists, and the Society of Toxicology. A frequent invited speaker at international conferences, Professor Pollard has also been on six NIH Advisory Committees. Alongside being a reviewer for 13 journals, he has over 50 publications to his name. K. Michael Pollard obtained his PhD from the University of Sydney, Australia. The majority of his career has been spent at The Scripps Research Institute in La Jolla, California, USA where he has been a faculty member since 1992. His publications include over 40 research articles as well as a number of book chapters and reviews. His major research interests include mechanisms involved in the initiation of autoimmunity and how the interplay between genetics and environment influences the expression of systemic autoimmune diseases. He and his wife Miranda, a veterinarian, share their lives with three Standard Poodles, and four cats named after famous Irishmen. 1 Introduction (K. Michael Pollard). 1.3 Autoantibodies as Diagnostic Markers. 1.4 Autoantibodies as Molecular and Cellular Probes. 1.5 Autoantibodies in Experimental Models of Autoimmunity. 2 Prefatory Chapter: The Importance of the Autoantibody-defined Epitope (Eng M. Tan). 2.2 The Uniqueness of the Autoantibody-defined Antigenic Determinant or the Autoepitope. 3 Self/Non-self Recognition (Alan G. Baxter). 3.3 The Clonal Selection Theory. 4 Central and Peripheral Tolerance (Robert L. Rubin). 4.2 Ignorance of Lymphocytes to Target Antigen. 5 T-B Cell Interactions in Autoimmunity (Barbara Schraml and Stanford L. Peng). 5.2 Direct T-B Cell Interactions: Receptor-mediated Contacts. 5.3 Indirect T-B Cell Interactions: Soluble Mediators. 5.4 The Nature of T-B Interactions in Autoimmunity: Ongoing Issues. 6 Cell Death and Autoimmunity (Carlos A. Casiano and Fabio J. Pacheco). 6.4 Impaired Lymphocyte Cell Death and Autoimmunity. 6.5 Cell Death–associated Autoantigen Proteolysis and Autoimmunity. 6.6 Defective Clearance of Apoptotic Cells and Autoimmunity. 6.7 Immunostimulatory Properties of Dying Cells. 7 Self-antigen Modification and Autoimmunity (Stuart M. Levine, Livia Casciola-Rosen, and Antony Rosen). 7.2 Learning to Ignore the “Self”: Immunologic Dominance and Crypticity. 7.3 Proteolytic Cleavage of Autoantigens During Apoptosis. 7.4 Cytotoxic Lymphocyte Granule–induced Death Pathways. 7.5 Many Autoantigens Are Specifically Cleaved by GrB, Generating Fragments Not Observed During Other Forms of Cell Death. 7.6 Grb-induced Cleavage of Tissue-specific Autoantigens. 7.7 Novel Conformation of Phenotype-specific Autoantigens. 7.8 Conclusion: A Model of Antigen Selection During Cell Death. Part 3 Autoantibodies as Diagnostic Markers. 8 Detection of Autoantibodies (Rufus W. Burlingame and Carol Peebles). 8.1 Comparison of Common Techniques. 8.2 Comparison of Common Tests. 8.3 Comparison of Antigens, Conjugates, and Cutoff Values. 8.4 Comparison of Multiplexed Assays. 9 Synthetic Peptides for the Analysis of B-cell Epitopes in Autoantigens (Jean-Paul Briand and Sylviane Muller). 9.2 Autoantibodies as Diagnostic Markers. 9.4 Peptide-based Methods for Detection and Quantification of Autoantibodies. 9.6 Peptides Containing Natural Modifications and Structural Motifs. 9.7 Peptides Containing Non-natural Modifications. 9.9 Cross-reactivity of Autoantibodies With Synthetic Peptides and the Cognate Protein. 9.10 Selected Examples of Epitope Mapping With Synthetic Peptides. 10 Autoantibodies and Systemic Autoimmune Diseases (Karsten Conrad and Michael Bachmann). 10.1 Characteristics and Classification of Systemic Autoimmune Diseases. 10.2 Distinguishing Features of Systemic Autoimmune Disease-Specific Autoantibodies. 10.3 Autoantibodies as Diagnostic and/or Prognostic Markers in Systemic Autoimmune Diseases. 11 Autoantibodies in Systemic Lupus Erythematosus (Falk Hiepe). 11.1 Introduction and Historical Perspective. 11.3 Antibodies to Cytoplasmic Antigens. 11.6 Autoantibody Assessment in Clinical Routine. 12 Autoantibodies in Rheumatoid Arthritis (Tsuneyo Mimori). 13 Autoantibodies and Organ-specific Autoimmunity (H. Bantel, J. Kneser, and M.P. Manns). 13.1 Role of Autoantibodies in Tissue-specific Organ Damage. 13.2 Autoantibodies and Autoantigens in Autoimmune Hepatitis. 13.3 Autoantibodies Frequently Associated with Autoimmune Hepatitis Type 1. 13.4 Autoantibodies and Autoantigens Associated with Autoimmune Hepatitis Type 2. 13.5 Autoantibodies and Autoantigens Associated with Autoimmune Hepatitis Type 3. 13.6 Autoantibodies Associated with Primary Biliary Cirrhosis. 13.7 Autoantibodies in Overlap Syndrome Between Autoimmune Hepatitis and Primary Biliary Cirrhosis. 14 Autoantibodies in Autoimmune Thyroid Disease (Osvaldo Martinez and Bellur S. Prabhakar). 14.2 Autoimmune Diseases of the Thyroid. 14.5 Development of Autoantibodies Against TSHR. 14.6 The Role of Genetic Factors. 14.7 The Role of Environmental Factors. 14.8 Assays for TSHR Autoantibodies. 14.10 Functional Domains of TSHR. 14.11 TSAb Epitopes in GD. 14.12 TSBAbs with TBII Activity. 14.13 The Heterogeneous and Homogeneous TSAbs. 15 Autoantibodies in Diabetes (Sarah M. Weenink and Michael R. Christie). 15.3 Islet Autoantibodies and the Prediction of Type 1 Diabetes. 15.4 Relationship of Islet Autoantibodies to T-cell Responses in Type 1 Diabetes. Part 4 Autoantibodies as Molecular and Cellular Probes. 16 Autoantibody Recognition of Cellular and Subcellular Organelles (Ivan Ra&scaron;ka and &Scaron;&aacute;rka R&uring;&zcaron;i&ccaron;ov&aacute;). 16.2 Autoantibodies Are Important in Clinical and Basic Research. 16.3 Epitopes Recognized by Autoantibodies. 16.5 Autoantibodies as Probes for Cytoplasmic Antigens. 16.6 Autoantibodies as Probes for Nuclear Antigens. 17 Autoantibody Recognition of Macromolecular Structures and Their Subunits (Erica A. Champion and Susan J. Baserga). 17.1 Autoantibodies Used to Probe the Function of Macromolecular Structures. 17.2 Autoantibodies as Probes for the Mechanism of Pre-mRNA Splicing. 17.3 U3 and the Box C/D Small Nucleolar RNAs (snoRNAs). 17.4 The La and Ro Autoantigens. 17.5 RNase P and RNase MRP. 17.7 NOR-90/hUBF and RNA Polymerases I, II, and III. 18 Autoantibodies and the Cloning and Characterization of Cellular Constituents (Edward K. L. Chan). 18.2 cDNA Expression Cloning as a Tool to Identify Autoantigens. 18.3 Autoantibodies to IGF-II mRNA-binding Protein p62 and Overexpression of p62 in Human Hepatocellular Carcinoma. 18.4 Unique Features of Golgi Complex Autoantigens. 18.5 Cloning of GW182 Autoantigen and Identification of GW Bodies. 19 Tolerance and Immunity to the Ro/La RNP Complex (Catherine L. Keech, Tom P. Gordon, and James McCluskey). 19.2 The Nature of the Autoimmune Response to La. 19.3 The Ro/La Ribonucleoprotein Complex. 19.4 Autoimmune Findings in Humans. 19.5 Autoimmunity to La in Experimental Models. 19.6 Tolerance to Nuclear Antigens. 19.7 Lack of Tolerance in the B-cell Compartment. 19.8 Tolerance in the T-cell Compartment. 19.10 Anti-La Autoantibodies Are Pathogenic in the Neonatal Lupus Syndrome. 20 Autoantibody Recognition of Functional Sites (Carlo Selmi, Sabine Oertelt, Pietro Invernizzi, Mauro Podda, and M. Eric Gershwin). 20.2 Anti-mitochondrial Antibodies in Primary Biliary Cirrhosis. 20.6 AMAs in the Pathogenesis of PBC. 20.7 Other Autoantibodies in PBC. 20.8 Concluding Remarks and Future Directions. Part 5 Autoantibodies in Experimental Models of Autoimmunity. 21 Novel Mechanisms of Autoantibody Induction and Pathogenesis in Experimental Autoimmunity (Yulius Y. Setiady and Kenneth S.K. Tung). 21.2 The Autoimmune Ovarian Disease (AOD) Models. 21.3 Mechanism of Induction and Antigen Specificity of Autoantibodies. 21.4 Pathogenic Mechanisms of Autoantibodies in Autoimmune Disease. 22 Environmental Factors That Contribute to Autoimmunity (Per Hultman). 22.1 Relation Between Genetic and Environmental Factors in Autoimmunity. 22.2 Environmental Factors in Autoimmunity. 22.4 Microbial Agents in Autoimmunity. 22.6 Prenatal Exposure and Postnatal Autoimmune Effects. 22.7 Acceleration and Aggravation of Autoimmunity by Environmental Agents. 22.8 Comments on the Accelerating Effect of Metals on Autoimmunity. 23 Genetics of Autoantibody Production in Mouse Models of Lupus (Dwight H. Kono and Argyrios N. Theofilopoulos). 23.2 Identifying Genes Predisposing to Systemic Autoimmunity. 23.3 Mouse Models of SLE in Mapping Studies. 23.4 Lupus Quantitative Trait Loci. 23.5 Loci in NZB, NZW, and NZBNZW Recombinant Inbred Mice. 23.6 Loci Identified in Crosses of MRL-FaslprMice. 23.7 Loci in BXSB Crosses. 23.8 Loci in Other Spontaneous Lupus Crosses. 23.9 Loci Identified in Induced or Mutant Models of Lupus. 24 Genetic Manipulation (Matthew C. Pickering and Marina Botto). 24.2 Genetic Pathways Leading to Autoimmunity: Lessons from Genetically Manipulated Models. 24.3 Epistatic Effects of Background Genes on Gene-targeted Models of SLE: The Importance of Appropriate Controls. 25 Perspectives (K. Michael Pollard). 25.3 Autoantibodies as Diagnostic Markers. 25.4 Autoantibodies as Molecular and Cellular Probes. 25.5 Autoantibodies in Experimental Models of Autoimmunity.